An easy to use app for keeping track of upcoming payments. 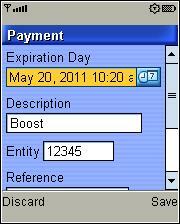 You enter the day and time that the payment is due and a description. The app plays an old school telephone ringer sound when your payment is due. You also have to enter two other required fields, a 5 digit “Entity” number and a “9 digit “Reference” number. There’s no help page or documentation so I don’t know what these fields are for although I suspect they are related to a pay by SMS feature. I’ve emailed the vendor about these two fields and how the payment feature works and will update the post if they reply. It looks like the alarm is supposed to work even if the app is suspended or not running. But on my Motorola i776 and Motorola Rambler it only goes off if the app is running in the foreground. Also, on the Rambler, PayManager often hangs and locks up my phone when I try to save a payment. The app “PayManager” (49 KB) is ready to download or send to your phone as filename:”PayManager”. I installed on my i465g and tested by creating a payment for 10 minutes later. I then saved it, and exited the app completely. When the time arrived, the phone alerted me the app wanted to automatically start, and then showed me the payment reminder I had created. So for the Clutch, it works when not running. But because of the need to enter in two useless fields: “Entity” and “Reference”, I would just recommend using your Datebook and set an alarm, just as easy, and no useless info required.